Christmas is a time of love, family and spending money. There are lots of events this time of year, but sometimes it seems like people forget that they don’t have to give away everything in their wallets. Here is a list with free or less than $10 events for you holiday penny pinchers. What: Celebrate Christmas early in the fashion of “Polar Express” with a train ride and a meeting with Santa. You can even wear your pajamas. The event will include a snow hill slide, a reindeer petting zoo and other festive activities. When: Dec. 6, 6 p.m. to 8 p.m.
What: This parade of lights is the largest lighted Christmas parade in North Texas. Just imagine downtown Grapevine but with colorful LED lights in every arch, roof and tree. Then more than 100 floats and cars also lighting up the street. 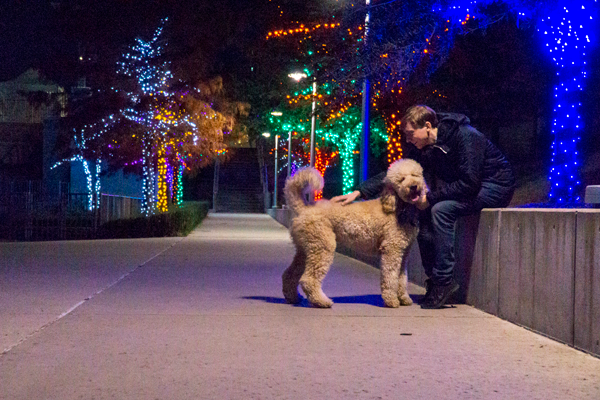 When: Dec. 6, 7 p.m.
What: Walk along a lighted path of trees with some friends, a loved one or anyone in between. The Christmas light-wrapped trees provide the perfect background for an Instagram selfie. On Dec. 8, country duo Sonny’s Holliday is expected to perform at a Magical Night of Lights event that includes food trucks, free photos with Santa, a donation drive and lots of Christmas-related activities. Parking for special events will be $10 but otherwise parking is free. What: Watch the largest indoor Christmas tree in the U.S. light up it’s 450,000 LED lights. The full ceremony is on Dec. 8 and includes Olympic figure skater Jeremy Abbott and a pyrotechnic Santa named Missile Toes, of course. Mr. Toes performs his ice skating stunts while shooting fireworks off his skates. The event ends with a countdown to the lighting of the 95-foot Christmas tree. The event will be repeated Dec. 15 and Dec. 22 with different Olympic skaters. When: Dec. 8, Dec. 15 and Dec. 22, 6 p.m.
What: If you’re still looking for Christmas treats, consider supporting local vendors. The White Rock Holiday Market will include local produce, meats, eggs and baked goods for all of your holiday recipes. The day will have live music, artisan-made gifts and baked goods. The market is expected to have this winter season’s produce like beets, oranges, blood oranges, lemons and cranberries. When: Dec. 8, 8 a.m.-3 p.m. When: Dec. 16 from noon-4 p.m.
What: Get lost in a maze, pet a kangaroo and join the candy cane hunt. This event is mainly for children. So if you know a little one who enjoys petting animals, don’t leave them at home. There will be a jumping pillow for those feeling relieved and not too exhausted from finals. For those over 5 years the candy cane hunt begins at 2 p.m.